Welcome to Bandit's Hideaway in Gatlinburg! 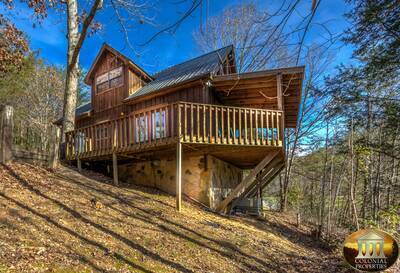 This charming 1 bedroom, 2 bath Smoky Mountain vacation cabin is the perfect place to enjoy your next getaway. Upon entering Bandit's Hideaway, you are immediately greeted by tasteful country charm and mountain themed accents. The expansive living room features one of the most spectacular river stone fireplaces we have ever seen. With gleaming wood tones, cozy furnishings and abundant windows, your time spent in this area is sure to be restful and relaxing. The fully equipped galley style kitchen offers everything you will need to cook and prepare a delicious meal or snack. Nearby there is a also the dining area that comfortably seats up to 6 people. There is also a comfy queen size bedroom and full bath located on the main level of Bandit's Hideaway. Take a walk upstairs and you will enter the exclusive and totally romantic master suite. This bedroom offers a huge, 2 person bedside jetted tub and it's own private mountain stone accented fireplace. After a day hiking, shopping or walking around downtown, it's the ultimate place to return and get a good night's sleep. If you're a nature lover, then you'll definitely want to spend some time on the full length screened in porch. Here you will find delightful rocking chairs and the oh so relaxing hot tub. The front covered porch is a perfect place to read a book or enjoy your morning coffee on the swing. Bandit's Hideaway is conveniently located in close proximity to either Gatlinburg or Pigeon Forge, so you'll be able to enjoy all of the great things there is to see and do while you're on vacation. The entrance to the Great Smoky Mountain National Park is also nearby. Plan your charming Smoky Mountain vacation today at Bandit's Hideaway and enjoy all of the awesome features this Gatlinburg cabin rental has to offer! A: Hi Dustin! Bandit's Hideaway is not a pet friendly property. We do have properties on our program that so welcome pets. A: Hi Dana! This cabin does not have WiFi at this time. Yes, all linens are provided this includes the sleeper sofa. A: Hi Dana! There is a king bed, queen bed, and a queen sleeper sofa. “ Very beautiful and cozy, me an my Family had a wonderful stay. Thank you for a great vacation. “ Very nice clean cabin. There are other cabins around but lots of trees so it seems really private. It's very close to Pigeon Forge. We would love to stay there again in the winter so we could use the fireplace. “ This cabin was fantastic! So comfortable...perfect place to leave the fast pace behind. “ Bandit's Hideaway was in a wonderful location. Up high, nestled in the trees. Even though there are several other cabins close by we felt private. The cabin jutted out enough that we felt like we were in a secluded area. The cabin had the most amazing features. Exposed wood beams, high ceilings and floor to ceiling fireplaces. It was very clean and the kitchen was incredibly will stocked. If we had not had lots to do in Pigeon Forge and Gatlinburg we would not have mined spending all of our time at the cabin. We were lucky that we had a full moon and spent our first night in the outdoor hot tub singing and laughing and talking with the full moon over head and so much peace. I will never forget that weekend and how that cabin was a great part of how wonderful it was for us. I will return here as often as I can, and the price was great, espeially if you are splitting it among several other people. “ We had a wonderful stay at Bandit's Hideaway. 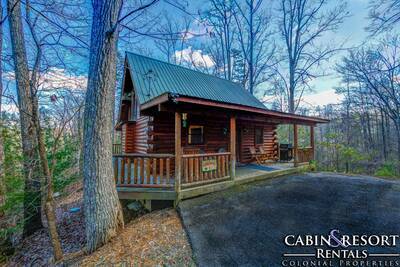 The cabin was clean, comfortable and a short distance from Gatlinburg and Pigeon Forge. The hot tub was clean and cozy. The check -in process was quick and the texting check-out was great. I highly recommend. “ Beautiful place! Exactly in the middle of the 2 important cities- Gatlinburg and pigeon forge. Awesome views easy to get to. “ My wife and I really enjoyed our anniversary getaway. Wished we could have stayed longer but as always vacations come to an end. Colonial Properties was very good to rent from. We had no problems and would recommend them to friends. Thanks for a great weekend getaway!! “ The cabin was great!! We had privacy and all the amenities needed to keep us at the cabin. “ I have been to the Smokies lots of times but never enjoyed myself as much as I did this time. We were on no time schedule. We got up when we wanted to, I fixed breakfest every morning, we would all get ready and go where ever, stay out as late we wanted to, come home late, fix a bite to eat, stay up as late as we wanted, go to bed and sleep as late as we wanted. The next day the people next to us were from Texas. They had rode their Harley's from there. We enjoyed our cabin very much. It had lots of room for the girls to run and play. They loved the hot tub & I loved sitting on the porch in the morning. All of it was fun! I will go back again and will be staying with Colonial Properties again, they are great! “ This vacation was the first of many. It was relaxing and secluded. A great place to get away from the busy lifestyle. My family and I am glad to have come. “ We had a wonderful weekend at Bandit's Hideaway. It is private yet so close to town. The cabin was awesome and beautiful. We will definitely use Colonial Properties again and would love to stay in Bandit's Hideaway on our next trip. “ Great Price. 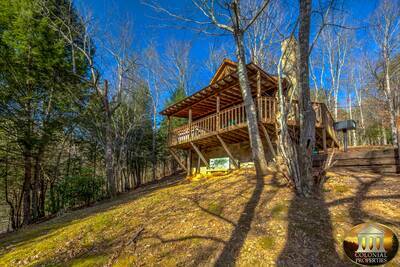 Wonderful location between Pigeon Forge and Gatlinburg. The cabin was very clean and spacious and we had a great view. We plan to use Colonial Properties for our next trip!! “ This was a beautiful cabin. Colonial Properties was a wonderful company to work with! They provided amazing amenities and was very prompt and polite with all of our questions. Had zero problems with anything. Will absolutely be coming back again! “ Wonderful stay...relaxing & refreshing...can't wait till our next stay! “ Loved every minute of our vacation. Cabin was clean and had everything we needed. Can't wait to come back. “ We have stayed at your properties several times. We will return! Bandits Hideaway has lovely decor. “ Great place between Pigeon Forge and Gatlinburg! I liked the log cabin type and that is what it is. I have had a good experience booking with Colonial Properties and have booked several cabins and am always pleased with the results. “ Everything was great. Cabin well kept and plenty of amenities. Great area, great view, great time! “ We loved it from start to finish! The cabin was beautiful clean everything was in perfect working order and your staff is absolutely superb in every way! If I could give you more than five stars I would! We can't wait to come back! And I'll tell all my friends about Colonial Properties! Thank you so much! “ We always come back and each time we are never not taken care of and have an excellent time! “ Wonderful cabin......Relaxing and quaint.......Hope to be back soon for another stay. “ Nice cabin and nice scenery that was partially secluded, yet still close to all the fun stuff. “ We had a great time on our vacation. Bandit’s Hideway was a clean and comfortable cabin to stay in. We really enjoyed the fireplaces and the hot tub on the deck. I would recommend this cabin. “ I decided at the last minute to take my wife to the Smokies for her birthday. The folks at Colonial Properties were very accommodating with every aspect of my last minute surprise. They arranged for a late night check in and provided a beautiful place for us to enjoy her birthday. The cabin was extremely clean, fully stocked with every item that you would need. I would highly recommend these folks to anyone who is looking to get away with their sweetheart or their family for a great time in the Smoky Mountains. “ This cabin was very nice, quiet and relaxing not to far away from attractions. “ Such a nice and beautiful cabin we loved our stay at bandits hideaway! It was very peaceful and really close to town! Just an overall really nice getaway from everyday stresses!!! “ My husband and I rented the Bandit's Hideaway for our anniversary. We have 5 kids so we were looking for a place to relax and that was peaceful. We really enjoyed the indoor jetted tub and the fireplaces! The home itself was very comfy and inviting. The coupons were also nice to have and were very useful. Our stay was a success, but like always was not long enough. “ The staff was very understanding & bent over backwards to make sure our cabin was a great experience. “ Colonial was able to make my grandson's trip special. He wanted a fireplace, hot tub and a jacuzzi. Everything else was a surprise - flat screen TV and jetted tub. The decor fit the name perfect - Bandits Hideaway. We have let friends and family know what a great place we stayed. Thanks Bandit. “ It was very clean and a very nice view and area.